For now, this will be the last piece in my Scream interpretation series. To add to embroidery, tapestry, rya, and sheepskin printing, I added fabric printing. I carved a linoleum block. Where should I test it? I printed on Ikea towels. What would Munch say? 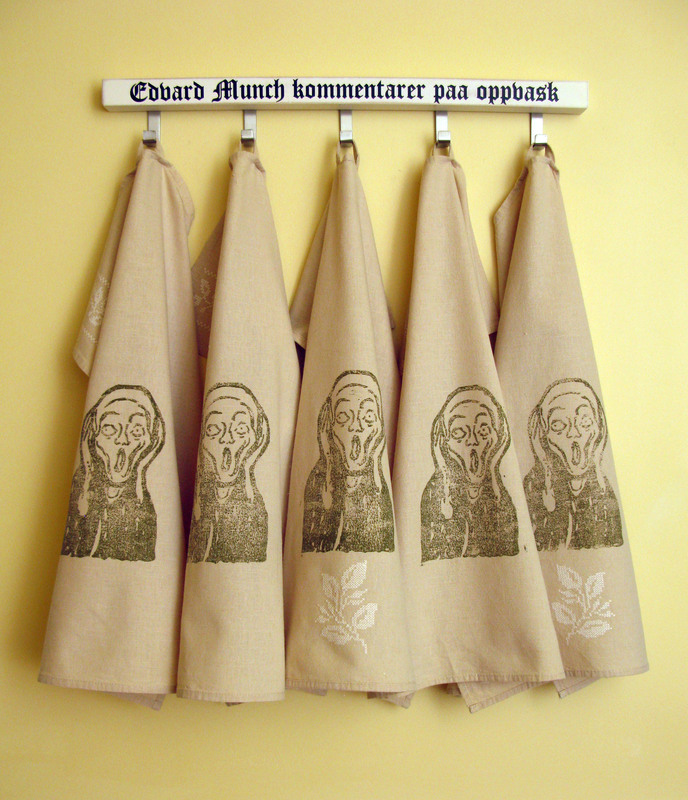 I hung them from a rack, also purchased from Ikea, with the words “Edvard Munch Kommentarer Paa Oppvask.” Loosely translated, it means “Edvard Munch comments on dishwashing (or washing up).” Because, did Edvard Munch ever think about washing dishes? What would he think about contemporary art commenting on women’s roles or domesticity? 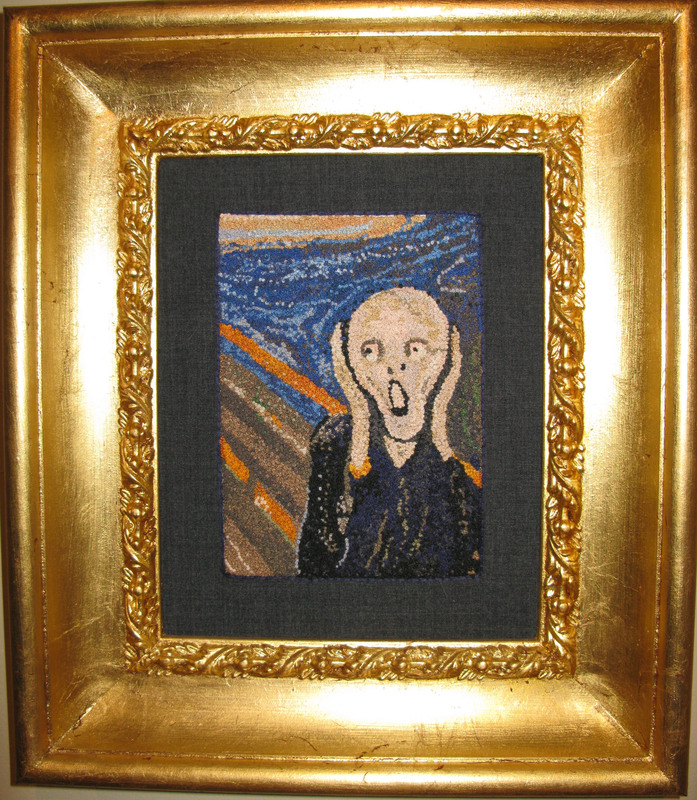 He might well find the reproduction of his image on dishtowels (and a billion other things, these days) offensive, or maybe he would be happy to make money selling Scream trinkets. Skrik has become iconic, and kitchy. It wasn’t until I wove the large Scream rya that I reacted to the emotional power of the image. Working with the screaming figure at a much larger scale than the original paintings, I wondered for a brief instant if my large piece might be pretty frightening. That thought was pretty inane, as I certainly don’t have the talent of Edvard Munch when he was first interpreting his images. The large rya piece fits squarely in the kitsch category. Still, it is a homage to the power of the original figure on the bridge. 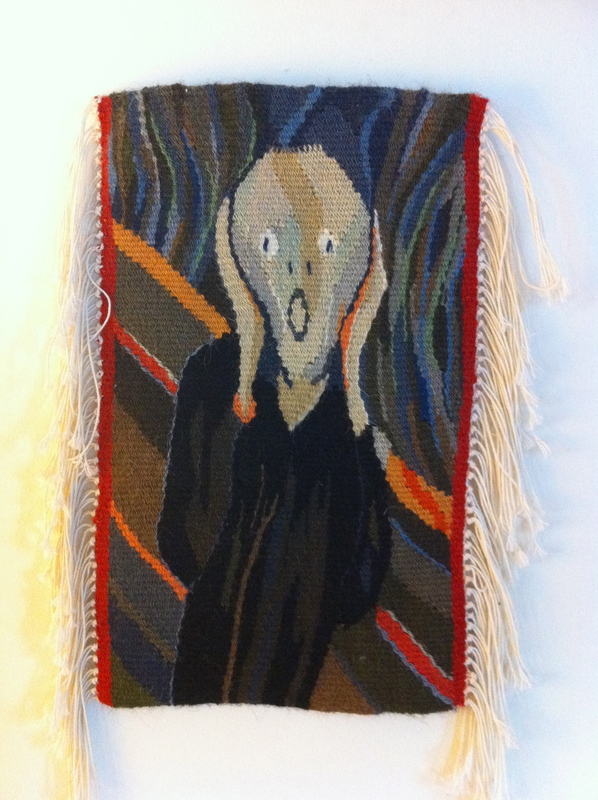 The series began with this tapestry. 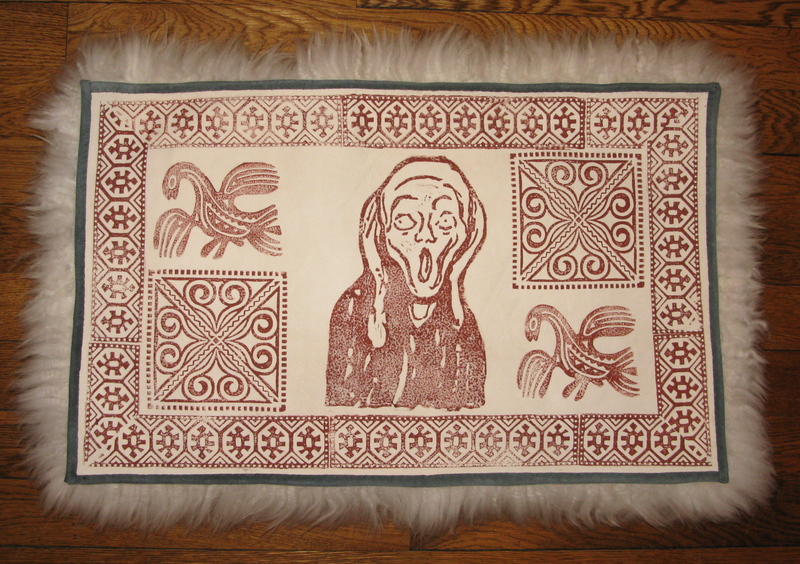 Here’s an embroidered Skrik, made with more than 9000 french knots. The linoleum block also became part of a piece printed on a sheepskin, along with very traditional Norwegian blocks/motifs. I liked the juxtaposition of folk art motifs with the fine art painting image. 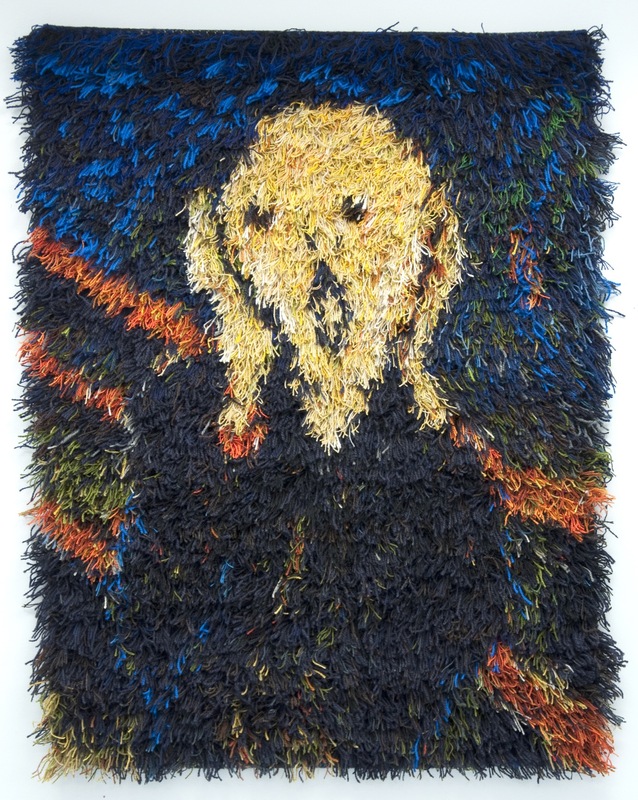 At the time that Munch painted, the traditional sheepskin coverlets were made, but I’m sure he could never imagine adding his image to those utilitarian pieces. I have ideas for more Scream interpretations; who knows, I might start up again. 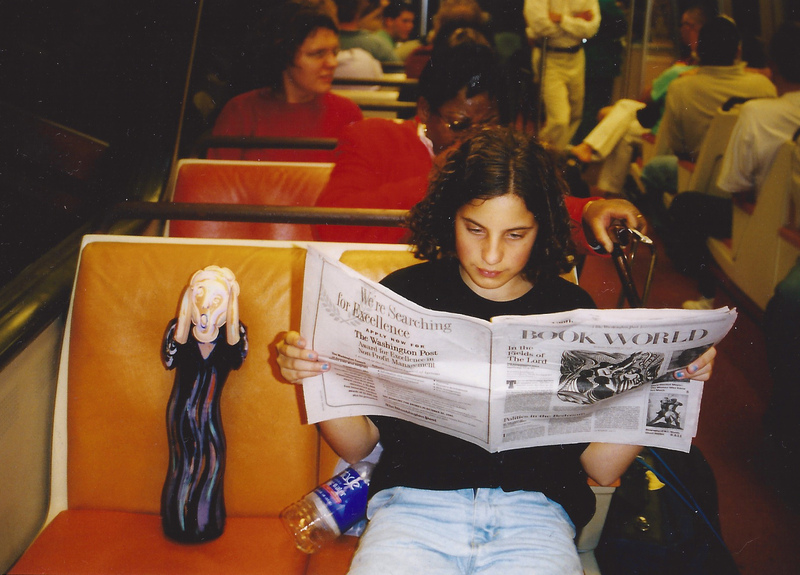 Next Post: Can the Tapestry Loom Travel to Phoenix?